This brief page makes a few incisive comments about flexo and some of the myths and missing ideas, plus a YouTube video explaining the ideas. There is a separate app on Anilox rollers. There aren't many scientific papers addressing the key step in flexo printing which is the actual printing process where rubber+ink meets the substrate then rubber leaves the substrate with ... well, with what? This lack of science is rather sad because there is another aspect of flexo that has been a great mystery: solid colours aren't solid - they are full of holes. Where do the holes come from? I put these questions to my colleague at U Leeds, Prof Nik Kapur, and he quickly realised that the process is essentially guaranteed to produce holes via a well-known (but not to the flexo industry) process. At MacDermid Autotype I put together a rough modeller of the process and the video below shows what happens. 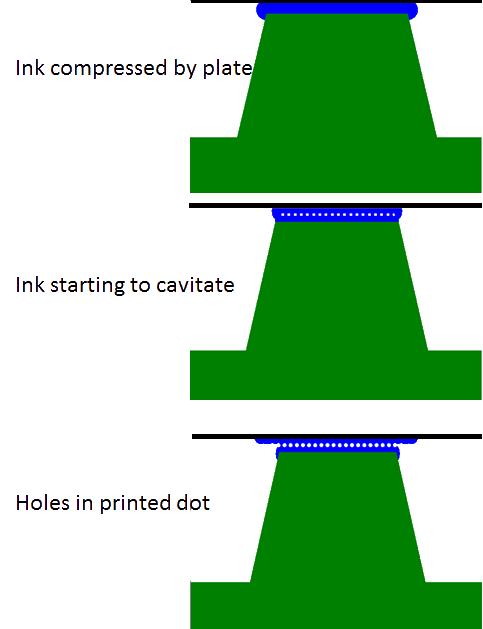 The modeller completely ignores the analox process which is merely a way to get ink onto the rubber ready for printing and is irrelevant to how the ink ends up on the substrate. But briefly, at the moment the rubber starts to come away from the substrate, the ink has to make a decision. It has to split between rubber and substrate and there is no reason why it should be anything other than 50:50. People waffle on about surface energy but unless you're printing onto silicone release paper, the surface energy is irrelevant. So how does the split take place? Given enough time, a nice meniscus could move along the interface, giving a beautiful, clean break. But when you draw the system to scale (and the model is not to scale), then a 100μm or 1mm sized dot has no time to move along the interface that is just a few μm thick. Instead the split has to take place via cavitation. The surfaces come apart and the ink simply cannot hold itself together. Instead, bubbles of air or solvent start to appear in low pressure zones created by the separation and these grow to produce the split and, not surprisingly, holes in the print. The physics of cavitation is well-known and those who know about "probe tack testers" used in pressure sensitive adhesives (discussed in Practical-Adhesion) will know that cavitation and crazing can be readily observed. The only mystery is why this obvious fact isn't known to the flexo community. Now, as it happens, for a perfect rubber, ν=0.5 which means that K=E/0=Infinity. In other words, you cannot compress a rubber. This is well-known, but again not to the flexo industry. Well, maybe they've learned in recent years. Thin flexo plates have many advantages, not the least of which are cost and processing time. How do they get conformability to a rough surface? Using a truly compressible layer of foam beneath the rubber plate. Easy!